Here's how I made this sign. Step 1: Choose a board for your sign based on the space you plan to put it. You can use any size board you have on hand. Some of the missing sock signs on Pinterest are large squares or rectangles, and some are just single pallet boards. My husband used six small pallet boards for this sign. He cut them to the size I wanted, then attached two boards (vertically) with a staple gun to the four horizontal boards to stabilize them. He then hung a couple sawtooth hangers at the top back. Step 2: Decide what you want your sign to say and create a layout before painting or applying stickers. For this sign, I used vinyl stickers that I made on my Cricut machine. I had some letters left over from other projects and I made the rest. You can also buy premade alphabet stickers. Lay your stickers out as you want them to appear on your finished sign. You can get all mathy and measure your board to be precise about placement, but I just eyed the placement of my stickers. Step 3: Choose your paint colors and get to lettering! 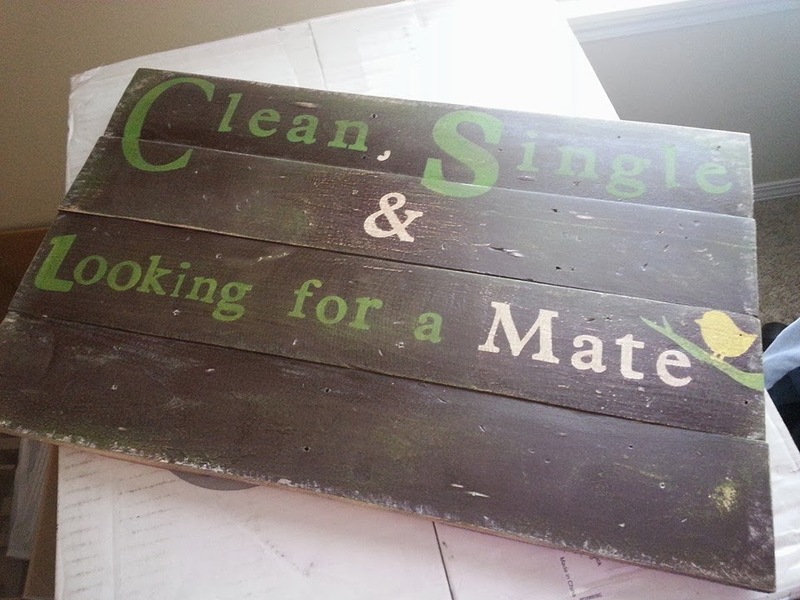 My house is decorated in a nature theme, and I chose brown, green, off white and yellow for this sign that I plan to hang in our laundry room. I wanted the words on the sign to be green and off white and the bird to be yellow. 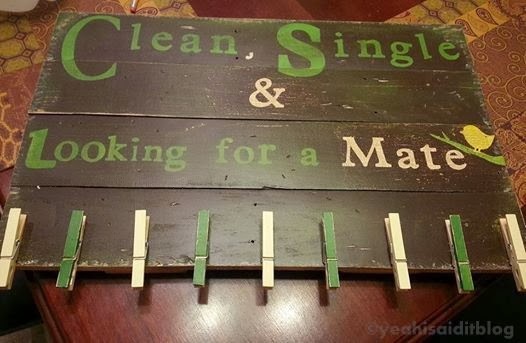 I wanted the top board to say, "Clean, Single". I painted that board green with acrylic craft paint and applied the vinyl stickers after the paint dried. (Acrylic paint doesn't take long to dry if you do thin coats.) The first photo shows my layout after the green paint dried. This photo shows how the vinyl stickers looked after I placed them on the top board. I decided that the second board would just have "&" and it would be off white, so I painted the area where I planned the symbol to go, let it dry, and stuck the sticker on it. My husband used his Xacto knife set to create a vinyl sticker of a bird, using one of my plastic bird stencils. (Isn't he sweet?) I made the branch with scissors and a strip of scrap vinyl. Step 4: When all your stickers are in place, it's time to spray paint over the whole thing! (I know! Scary!) Make sure your stickers are firmly pressed down without any lumps or air bubbles so the spray paint doesn't bleed under the stickers. I used an old piece of cardboard to put the sign on in the garage, and I sprayed on two light coats of Rustoleum paint in Espresso with a satin finish (from Walmart). You can also just use newspaper under your sign. 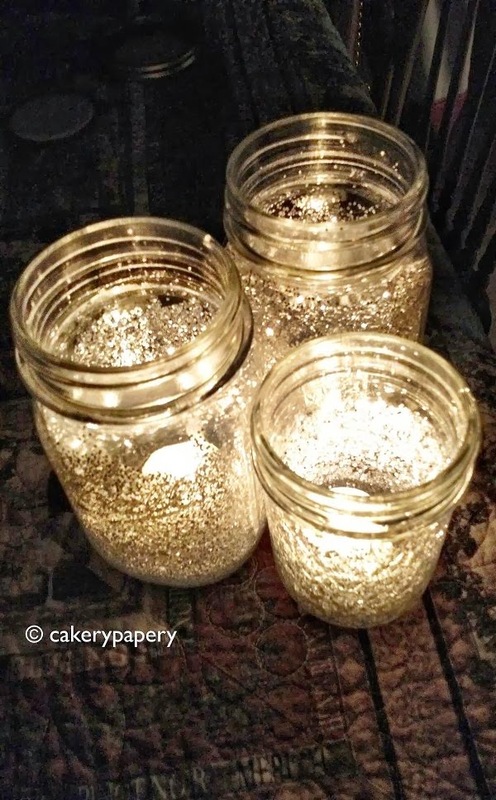 Spray paint takes longer to dry than acrylic paint does, so give it some time. It needs to be fully dry before you peel off the stickers. You guys, I'd never done this before. I was afraid I'd screwed up all that work! But I didn't!!!! Step 7: Place your sign back on your cardboard or newspaper and spray two light coats of sealer. This will protect your sign's finish. (For outside signs, you'll want to use something heavy duty, like polyurethane. And you'll want to wait to apply it until all parts of the sign are done.) Let it dry. I glued the off white clothespins on first. Then decided I needed more. All done! Now go grab your sock singletons and pin them on. P.S. I think this is my first tutorial, so if I forgot something, let me know! Early one evening I went to Taco Bell because Danielle wanted a couple Taco Supremes. These were always her favorite because she loves sour cream. I came home with three for me and two for her just like she ordered. I set the bag of tacos on the table and went into the kitchen for drinks. Next thing I know, Danielle is yelling about how "These aren't Supremes!!! Idiots!!! They can't do anything right!!!!! I....they...AARGHH!!!!! And off she ran to the bedroom crying all the way. Well, there I was, standing in the kitchen with two glasses in my hands wondering what just happened. I checked the tacos and found that they had just forgotten the tomatoes. So I added some tomatoes from the fridge and approached the bedroom. After explaining the situation, Danielle simply said, "OK," and came out and ate her tacos. So there you have it. My shining pregnancy moment with Nature Boy. And he hates tomatoes. I have no riveting taco picture to add to this post. (Sorry to disappoint.) 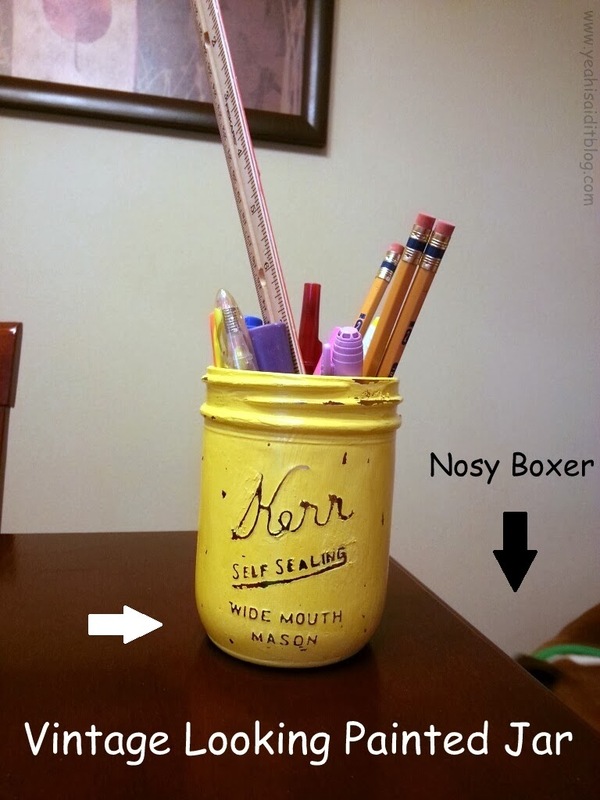 But I do have a crafty Pinterest-y one. Hi blogosphere. It's me, Pregzilla. Happy 2014, y'all! I'm behind the times, I know. Haven't got my bloggin' mojo back, and might not ever. Blame Facebook. There's actual interaction there! It's perfect for attention-whoring. I'm reporting to you today from about mid-pregnancy. In short, less indigestion, more bitchiness. I'm off my mood stabilizer and down to about half the usual dose of my beloved Zoloft. Most some days I see glimmers of the old unmedicated me. It's scary. It makes me think, Maybe I'm not as nice and self-actualized as I like to think I am. Maybe it's all medication! The crazy's all real though, I assure you. The good news is, in a few more months, I'll be back among the fully medicated. I am totally believing I'll have another round of Postpartum Euphoria. I had it after having Nature Boy. It was awesome. I was walking through Walmart, whistlin' all the while. Smiling at people in their fuzzy jammie pants. Not turkey necking anyone. Just so happy to be a mom. Which is in sharp contrast to my typical daily interactions right now. I posted the following story on Facebook, but I think it deserves a spot here as well. I've had a few cranky days. Ain't gonna lie. 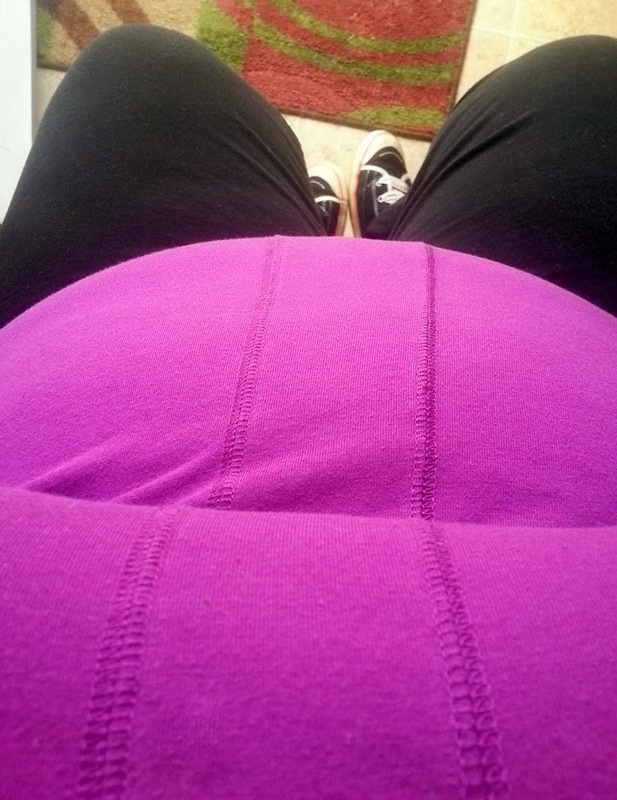 I had my first pregnancy-induced food tantrum two days ago. Over pizza. 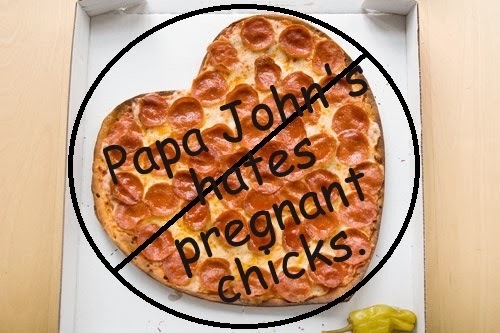 Papa John's to be specific. I couldn't even eat pizza when I was pregnant with Nature Boy (red sauce!!!!) But with this new one, I want the sauciest pizza I can get. I spent 30 lovely minutes planning my (frugal online coupon supported) order. Mushrooms. Onions. Extra sauce. Garlic dipping sauce. The boy lied. Lied, I say! 45 minutes into my meal planning, I called again and was told by a different Papa John's worker that they only deliver to one block east of my house. And that I couldn't get the awesome online deal if I ordered over the phone for pickup. I was all, "That's only one more block! I've been trying to order from you guys for 45 minutes! That's it!!! I'm not ordering from you!! Bye!!!" And I hung up on the poor girl. Because certainly she has power over Papa John's delivery routes and was purposely withholding pizza from me. As if that's not bad enough, I then refused to call anywhere else or make any pizza-related decisions for the foreseeable future. I was done! But I still wanted pizza. So my husband, who worked all day (his 6th workday in a row) had to take over the rustlin' up of some grub. By then it was almost 7 on a Saturday night and Pizza Hut (who is much more accommodating to us country folk) was on a 75 minute delivery delay. My guys looked at me fearfully. Could I handle a 75 minute wait? Finally, Nature Boy broke the tension by saying, "Mom, don't hurt me, but you are being really high maintenance! " My husband busted out laughing, saying, "I totally could not get away with saying that!!!" To my credit, I didn't frog my son or throw something at my husband. I WAS being high maintenance. So I laughed. And the pizza, when it finally arrived, was totally worth the wait. Sadly, this pregnancy food tantrum is not my first. My husband wrote down my previous pregnancy's Pregzilla moment in Nature Boy's baby book. I'll post it here later this week. When I'm not all up in my hormones, I am actually feeling really grateful. After 10+ years of infertility, I never thought I'd be experiencing this again. It's amazing, really. The creation of new life is always a miracle. But when it happens to someone who has struggled with infertility, it's magnified. Pregnancy is such a normal, everyday occurrence for so many people, it's easy to lose sight of the wonder of it. Flashback Friday: Attention shoppers! There's a lunatic on aisle three. Guest post: Neuroses - Mine or Hers? My kid's a genius. And so is yours. © Yeah, I said it. All rights reserved. Powered by Blogger.